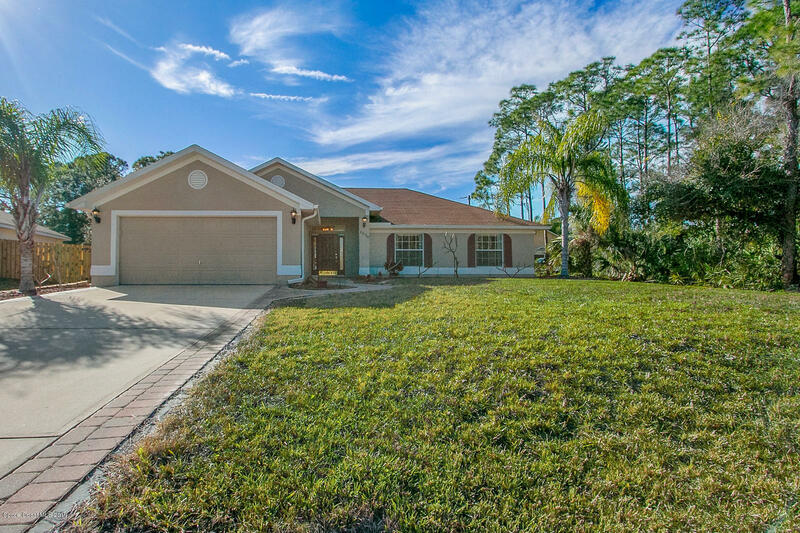 Don't miss out on this beautiful 4 bedroom 2 bathroom home with a 2 car garage in Palm Bay! Split bedroom has a master bedroom with a double vanity and walk in closet. Freshly painted and new carpet in living room! Kitchen has GE stainless steel appliances with a breakfast bar with a view of the living room. Kitchen and bathrooms have granite countertops. Home features programmable door locks with Nest smoke and Co2 detectors. Has WiFi enabled touch controlled thermostat from Carrier Infinity compatible with both Android and IPhone apps. Home comes with hurricane shutters and hurricane rated garage door. Quick and easy access to the Heritage Parkway, 15 minute drive to Melbourne. Room for you to put in a pool with a large backyard. Easy to show, this home won't last long!